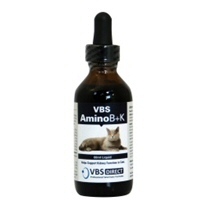 VBS Direct Ltd - VBS Amino B & K - Innovative solutions for the veterinary professional. Amino B+K delivers the 2mEq of potassium with each 2 ml administered. Delivery is easy due to this formula’s highly palatable liver and bacon flavouring, and the plastic dropper ensures safety and accuracy in dosing. Amino B+K also provides additional nutritional support with a dense nutrient profile including B-Complex vitamins, aqueous liver fractions and essential amino acids. 2 ml per 4.5kg body weight 1 to 3 times dailyDosage may be modified as per your veterinarians’ instructionsConsult your veterinarian for appropriate use in dogs.